Are you not a native English speaker or facing grammar and spelling mistakes when writing articles? If yes then you’re not alone, I am also on the line 🙂 Have you tried Online Grammar Checker Tools for writing errors free articles? When I started blogging I was afraid because of English, I am not expert in this and believe me it is not essential. You just need to know intermediate level skills for writing excellent blog posts. The only purpose is, readers understand what you are talking about. In blogging, We are not in the competition of winning English awards. We as a blogger just want to share our skills with other online readers who wish to learn new things or searching for solutions to FIX their problems. So, to share your skills with others, you should know how to write posts that readers understand easily. In this scenario, you should be enough good in English. Long story short, the core summary of the above paragraph is, you should know the basics and some advance knowledge about the English language. You should know how to deliver your voice into words that readers can readily understand instead of making them confused. So, I found some of the 12 Best Online Grammar and Punctuation Checker Tools to fix common English mistakes that may cause feeling embracement when we blog in English as a primary language. 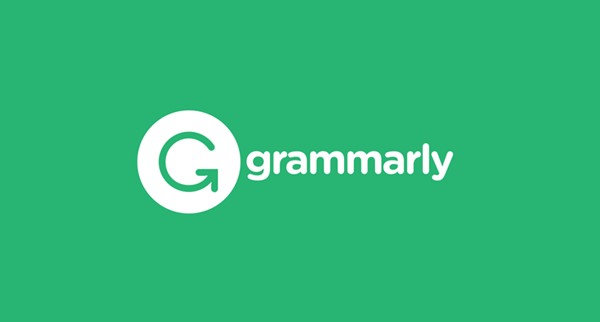 Grammarly is a vital online grammar checker tool, and I highly recommend it over other tools. Because I also use it for writing error-free blog posts. Grammarly is the best tool to check Grammar errors, spelling mistakes, punctuation and it also helps to enhance vocabulary. It instantly starts working when you write something and check errors with upto 400+ grammatical rules. You can also select the type of writing such as if you are writing essay or review you can choose document type as “Essay” in options. Grammarly easily can be integrated with Google Chrome, Mozilla Firefox, and Safari via add-on/extensions. It scans the text and highlight mistakes with red and green underlines. Grammarly also helps to find the synonyms of any word, just double-click on any word it instantly suggests synonyms for the desired word. Plagiarism Checker is another best feature of this tool that can help you check duplicate content. OR if you offer Guest Posting on your blog, you can check whether guest content original or not with this awesome feature. It checks the content in thousands of website it has stored in its Database and alert if the content is not original or already written on another site. Plagiarism Checker and some advanced features are available in Premium Subscription, but you can use the free version for checking basic errors. The premium services are available at $29.95/monthly, $59.95/Quarterly, and $139.95/yearly fees. Though it’s a little bit costly but the features they provide really worth it. You might like to check following “Best” Grammarly alternative and similar tools. When we talk about best grammar checkers available in the market, how one list can be completed without adding “WhiteSmoke”? It’s a premium tool that analyzes your text for hundreds of errors and comes with dozens of templates to enhance the content readability. Just like Grammarly, WhiteSmoke also performs spelling, Grammar, Style, and Punctuation, etc. rules detection to address mistakes and thus suggest appropriate recommendations. The company is generous enough to offer intensive self-learning videos tutorials. Its core algorithm built with Natural Language Processing (NLP) and patented artificial intelligence technology to scan your texts and empowered by an intuitive dashboard to provide easy-to-navigate control panel. There is also a translator feature available that can translate your text for more than 50 languages. They are continually improving and enhancing the accuracy of their software with the help of linguistic experts, NPL technology, and statistical algorithm to provide highly accurate results or translations. For each highlighted error, it shows explanation and details to help the users learn English rules. This online grammar checker software also includes plagiarism checking feature to help writers and bloggers craft unique posts. They don’t offer any free version, so you’ll have to buy a premium plan before using it. But, your money is safe as the company has 30-days money back guarantee. It can be integrated with Windows, Microsoft Office, Mac OS, Chrome, Firefox, Opera, Safari, and Internet Explorer. You can also install a mobile app available for Android and iOS as well. Ginger is another best grammar checker to improve your English skills. It is available in both versions free and paid just like above tool. Ginger has many features, one of them is the translation that helps to translate any paragraph or word into 40 different languages. I used it many times because of its “Rephraser” feature. Rephraser helps to write the same meaning of the sentence by using different words that make the sentence more attractive. You can craft impressive and high quality sentences with just a simple one-click option with this option and it will rephrase word with antonyms, idioms, synonyms, and phrases. As you know, writers need grammar checking tools at any place and for those Ginger proofreading tool is best. Ginger will help you any time at any place to solve your grammatical errors and spelling errors because you can use it on Android phone, iPhone or any smartphone. You can install Ginger on your computer as well as in web browsers such as Google Chrome and Safari. Also, it’s can be integrated with other writing tools like MS-word, etc. At the time of writing it’s available for following platforms; Windows, Mac, Android, Browsers, and iOS. To get maximum out of it, you need to buy their premium services that start from $5.10/month. With a Premium plan, you get Text-Reader to hear any sentence or paragraph that is not available in free version. PaperRater is a freemium online grammar, spelling, and plagiarism checker tool for articles checking. Its robust grammar and spelling checking system help you to write error-free posts/articles. You can check the quality of your content with a number of education levels such as 1st Grade to 12 Grade, College, Graduate, Doctorate, other, and also article type. PaperRater Plagiarism Checking feature is the best way for checking duplicate content issues, you just upload, type or paste your content and hit the button, it will check text plagiarism with over ten billion documents. It’s the best way to validating own and guest post content from duplicate posts issue, But for this feature, you need to buy premium plan start from $7.95/month. It has the ability to correct spelling errors, punctuation, grammar, vocabulary mistakes while we writing articles and also have an auto-grader function that helps to Grade articles. PaperRater is available in free and paid versions, but it does not have computer software or browser extension so you must have internet access. Here are key features of this online grammar checker; Plagiarism Detection, Auto Grader, Spelling and Grammar Check, Style and Word Choice Analysis, Readability Statistics, Title Validation, and Vocabulary Builder tool. Have you confused with the name of this online grammar checker tool? After The Deadline is also known as PolishMyWriting and is developed by Automattic Inventions. It is an online spelling error, grammar suggestion, and style suggestion tool that is very helpful to check common grammatical mistakes that we made while writing content. After The Deadline is very smooth and quick online spelling checker tool. There are numbers of ways to take benefits from this free online grammar checker. You can paste the contents into the box and click on “check writing button” and it will show errors by Red and Green underlinings with suggestions. Also, you can use it with a Self-Hosted wordpress site, Google Chrome, and Firefox, etc. AtD works very quickly and fastly to address english grammar mistakes. Right now you cannot integrate it with Microsoft Office because it is available in the form of plugins/add-on that only works with online platforms. But by visiting AtD site, anyone can easily use this spelling and grammar checker to make their articles error-free. As I said above, It underlines wrong words with the red and blue line that represents complex words. And the Green line shows the incorrect placement of words such as using “a” where “an” fits better. After the Deadline spell checker is available for Spanish, German, Portuguese, and French. It’s absolutely free for personal use as well as commercial and available under the GNU General Public License. SpellChecker.net is another free online grammar correction tool that used for checking spelling mistakes, grammar errors and also show the thesaurus of words related to the inserted text, which can utilize for the content. You can check Spell and Grammar one-by-one by clicking provided buttons located at the top of the windows. One thing that is best about SpellChecker.net tool is that it highlights all words that have their similar words in the dictionary and show the list with their Categories and its synonyms. You can quickly replace any word with suggested words to make your content more user friendly. All you need to do is paste your content into the provided box and click on “Basic” or “Advance Check” button. A popup windows would appear to show the mistakes. You will see Red and Blue underlines for words that need correction. OnlineCorrection.com is designed for checking basic grammar, spelling and stylistic mistakes. It is one of the simplest, easy to use tool, and aan dvanced version of TextCorrection.com. It also shows how many grammar mistakes happened in writing, spelling errors and show if there is any space needed in the article. You can use this free grammar corrector tool for checking contents written in upto 8 languages. But remember one thing if you are using this tool, you should check contents with a professional editor or proofreader to validate that your materials are good as it should be. Spelling Check Online is an excellent online grammar tool to write error-free English articles and can be used for spelling and punctuation checking. It has two different versions for addressing spelling and grammar mistakes. 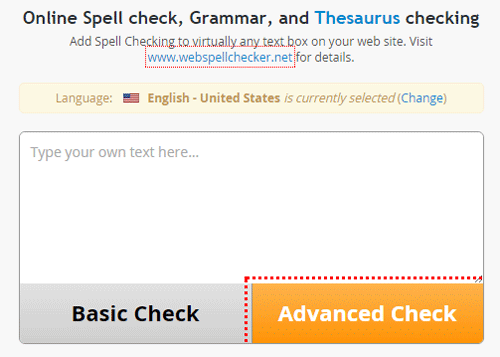 With SpellingCheckOnline, you can find spelling issues if you want to correct grammar issues then try their GrammarCheck free tool. The working principle is very simple as above tools, all you need to do is type or paste content that needs to be check, select language and then simply hit “Check Spelling” button. It will show results after a few seconds. You can validate content accuracy with 11 languages. In case, you want to check grammar or proofreading, they offer a free grammar checker in which spelling issues, styling suggestions, and grammar errors underlined with different colors. Visit GrammarCheck.net for crafting awesome and unique contents. LT is one more open source proofreading, free grammar, and spelling checker available to correct English mistakes as well as German, French, Polish and more than 20 other languages. It can help you find grammar and spelling errors that a basic checker cannot with highlighting wrong words in yellow and pink colors. Language Tool freely available for Desktop, LibreOffice. OpenOffice, and Mozilla Firefox. You can also download the beta version of Google Chrome to take maximum out of it. 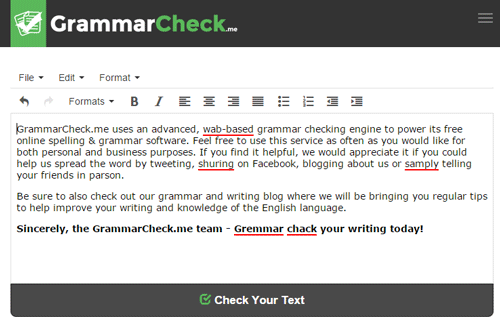 GrammarCheck tool is also very useful for effective personal and business writings. It looks like a standard editor with all the basic functions such as creating new documents, save documents and also printing facility. With the visual formatting feature, you can make your text italic, bold, underline, list and much more that are not available in other online grammar checkers. GrammarCheck.me uses an advanced web-based grammar engine to optimize text by solving grammar and spelling mistakes that we never notice. Are you looking for good looking best online grammar checker? I highly recommend to give it a try, you will appreciate its look and work. 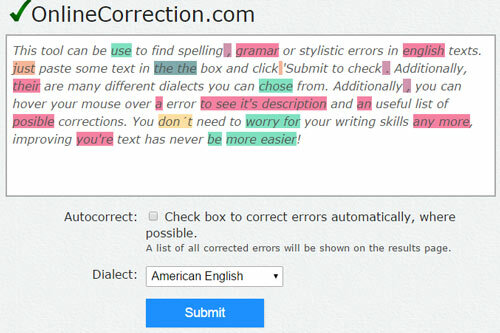 Online Text Correction is another free online grammatical errors and spelling checking tool for fixing grammar mistakes. It is very simple and easy to use corrector tool. All you have to do is just type of paste content in the box and hit the “Check Text” button. It will instantly show results with underlining wrong words by red and green colors. You can use this simple tool for addressing spelling and grammatical issues but cannot check punctuation. So, after finding and fixing mentioned errors, you should use at least one proofreading/punctuation checker tool to make articles better. HemingWay is an online tool provides spelling and grammar checking opportunities with some extra features. You can monitor words, paragraphs, characters, letters, reading time, and readability grade. When you write or paste text content in it, it shows instant results. No more copy-pasting, you can import and export .docx files with Hemingway Desktop App. It can also handle everything essential for the web, including formatting, links and HTML heading tags. The one best thing about App is no internet connection required to take benefits from it. Like GrammarCheck.me it also comes with visual text formatting feature, so you can completely write an article within this editor by using italic, bold or heading tags, etc. Desktop App of this spelling and grammar checker tool also available for Mac and Windows operating system at the price of $9.99. So, Following are some excellent spelling, grammar and punctuation checker tools that you can use for correcting grammar mistakes. Though there are also many others available on the net, but I have created this list after checking every single tool one-by-one. So, you can try any of them without any hurdle for crafting great articles. I am personally using GRAMMARLY ONLINE GRAMMAR CHECKER for handling proofreading and grammatical mistakes, as it checks 250+ rules. Also, it’s plagiarism feature is great for validating duplicate content issue. In the End, Is there any online grammar checker I missed on this list? If so, feel free to suggest me. Don’t hesitate to share your thoughts about this article and please share which one tool you’re using for correcting english mistakes.